A City Dreaming (2016. 295 pages) is a new urban fantasy novel from Baltimore born, Daniel Polansky, who has previously published his Low Town series of novels as well as the Empty Throne novels. I’m guessing that someone in the PR or publishing house wasn’t quite sure how to sell the book. They have come up with a premise that M is somehow caught up in a struggle for power between the two most powerful witches in New York; the truth is both less and more. The witches do appear but the book has little in the way of a strictly linear narrative. In the first chapter we bump into M back in New York and suddenly wanted by a lot of people. It turns out that M has a particular talent set which means he is useful for getting his friends and acquaintances out of difficult situations. M is also gifted with a Sardonic and insightful wit, bordering on the caustic, hidden beneath a thin veneer of a lackadaisical slacker. Each chapter is an almost self-enclosed vignette of a story and whilst they make up M’s journey through the city, they could just as well be read as short stories as, for the most part, the only constant is M himself. Instead of a central narrative we are offered M as the anchor and the driver of the stories. There is no real explanation as to why he lacks a first name, certainly there appears no connection to Fritz Lang’s child murderer. M belongs to a select group who are well in with ‘The Management’. Although not specifically made clear, you get the impression that these are people who have a modicum of magical ability, which means that they live their lives as if their luck had been turned up to eleven. Never short of money, drugs or women for that matter, some other thing is driving M, a wanderlust that has yet to be satiated. 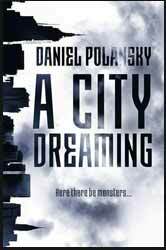 Polansky fills the book with all manner of impossible things. On one level it’s an insightful love letter to New York, on another it's a satirical smash up between Monty Python, Hieronymus Bosch and Kafka, strange being the order of the day, with the books title mirroring the dreamlike quality of the writing.